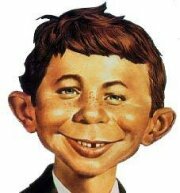 Alfred E. Neuman is the fictional mascot of EC Publications' Mad magazine. The face had drifted through American pictography for decades before being claimed by MAD editor Harvey Kurtzman. Neuman's likeness, distinguished by jug ears, a missing front tooth, and one eye eerily higher than the other, has graced the cover of most monthly issues. He first appeared in November 1954 on the cover of Ballantine's The Mad Reader, a collection of reprints from earlier issues. In 1956, his identity became fixed and his finetuned image was first rendered in iconic form by Norman Mingo. Mingo would become the magazine's signature cover artist through the 1960s and 1970s. Several 1950s Neuman covers were also painted by the "dean of Science Fiction artists," Kelly Freas. Neuman has appeared as Santa Claus, Darth Vader, George Washington and Uncle Sam ("WHO NEEDS YOU"), to name a few. He is periodically offered as a candidate for President with the slogan, "You could do worse, and always have!" Along with his face, Mad also features a humorous quotation by him in every issue. His catch phrase is "What, me worry?" Neuman's origins are shrouded in mystery and may never be fully known. One theory is that the likeness of Neuman may have derived from an late 19th century popular newspaper comic strip, The Yellow Kid. Many advertisements from that era included the likeness and his famous slogan, which was likewise, "What, me worry?" When Mad was sued for copyright infringement, one defense it used was that it had copied the picture from materials dating back to 1911. His image has also been used negatively, as a "supporter" of rival political candidates (with the idea that only an idiot would vote for them), and even by the Nazis for racial propaganda as an example of a Jew. An almost-identical image appeared as "nose art" on an American World War II bomber, where it was sometimes referred to as "The Jolly Boy". Since the EC editors had grown up listening to radio, this was reflected in their stories, names and references. The name "Alfred E. Neuman" derived from comedian Henry Morgan's radio series. Morgan began with Meet Mr. Morgan on WOR in 1940, continuing until 1950 with Here's Morgan on Mutual, ABC and NBC. One gag on his show involved a reference to Alfred Newman (1901-70), who scored many films and alsocomposed the fanfare that accompanies 20th Century Fox's opening film logo. The possible linkage is that Laird Cregar portrayed Sir Henry Morgan in The Black Swan (1942) with Tyrone Power, and the Oscar-nominated score for that film was by Newman. Listening to the sarcastic Morgan's brash broadcasts, Mad editors took note of the Alfred Newman gag and twisted the composer's name into Alfred E. Neuman. Morgan later became a Mad contributor with "The Truth about Cowboys" in issue #33. Mad Magazine is an American icon and hardly needs an introduction. The usual gang of idiots is still publishing some of the finest and funniest social and political satire on the market. 12 issues Only $2.00 per issue. That is 43% off.